Pritt BS, et al. Lancet Infect Dis. 2016;doi:10.1016/S1473-3099(15)00464-8. A new species of bacteria is causing Lyme disease in people bitten by ticks in the upper Midwest, according to the results of a recent study. Researchers cautioned that patients suspected of being infected by this species — tentatively called Borrelia mayonii — likely are not being evaluated for Lyme disease because they present differently from those infected by the only other species to cause Lyme disease in North America, B. burgdorferi. The researchers emphasized that medical and health care professionals should be aware of the new pathogen. Research conducted at Mayo Clinic in Rochester, Minnesota, from 2003 to 2014 targeted the oppA1 gene of B. burgdorferi and found atypical PCR results in six of 102 specimens that tested positive from the 9,197 submitted from residents of Minnesota, Wisconsin and North Dakota. Blacklegged ticks were collected from regions of suspected patient tick exposure in Minnesota and Wisconsin and were tested by oppA1 PCR. Figure 1. 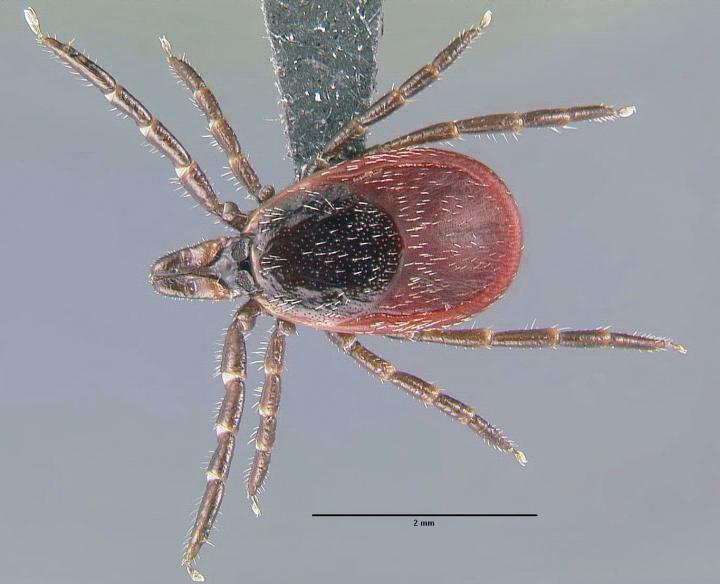 This is a blacklegged tick (Ixodes scapularis), one of the most common vectors of Lyme disease. Researchers found that while B. mayonii is closely related to B. burgdorferi, the new species caused Lyme disease with an unusually high spirochaetaemia, and patients suspected of being infected with the new species presented differently. Both bacteria cause fever, headache, rash and neck pain early on and arthritis later, but four of the six patients suspected of being infected with B. mayonii presented with nausea or vomiting. At least two patients had diffuse macular rashes (rather than a single “bull’s-eye rash”); two had a fever over 39°C; and three had symptoms potentially consistent with neurological effects such as confused speech, profound sleepiness or dizziness. Patients were treated successfully with common antibiotics, including doxycycline, and the CDC recommended that people infected with B. mayonii follow the antibiotic regimen described by the Infectious Diseases Society of America. The researchers said failure to identify the new species in samples tested from other states might suggest that it recently emerged in the upper Midwest. Wormser GP, et al. Clin Infect Dis. 2011;doi:10.1086/508667. Disclosure: Petersen reports no relevant financial disclosures. Please see the full study for a list of all other authors’ relevant financial disclosures.